I used Super Sculpey for the mask/clothing. Once I was done sculpting, I place the figure in the oven on a flat surface (metal or glass) at 275f (130c) for 15 minutes. I made sure to let you figure cooled down so it can harden, I gave mine like 30 minutes to cool down. Then I started painting!! Finally!!! I used Craft smart acrylic paints for Black,Flesh, and white. each bottle was $0.69 and I used Dazzling Metalics ice blue which was $1.99. Now for the final step. I used Mod Podge:Gloss-Lustre-Luster to seal the paint and give the figure a nice shiny protective coat. I got my clay,paints, Mod Podge from Michael's art suppliers store it was all pretty cheap to get. 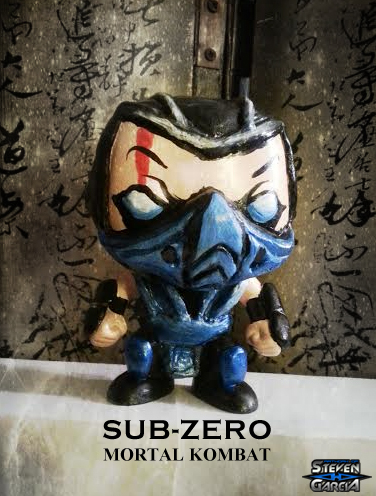 I had alot of fun making my own Sub-Zero, this was my first ever custom Funko Pop. Hope this helps you in creating your very own Funko Pop.